Of all Suffolk, I like cycling the north-east best. Drop me anywhere that's roughly in that area beyond a line drawn from Diss to Aldeburgh, and I'm happy. Mind you, there are a few roads up here that aren't such a joy, and one of them is the Beccles to Lowestoft road. For much of the Norfolk/Suffolk border, the traffic is on the Norfolk side of the Waveney; but here, it hurtles along relentlessly through what must once have been pretty little villages like Shipmeadow, Barsham, North Cove and Barnby. It is easy to escape it; a quarter of a mile either side, and you wouldn't know it was there. But that is of little consolation to the pretty church of St John the Baptist, Barnby, which sits right beside it, protected only by a few cottages which front its ancient mound. Parking is about as difficult as it could be for any church in Suffolk. I first came here about ten years ago. I was cycling from Lowestoft to Ipswich, a regular ride for me in those days which seemed to have an infinite variety of routes. Despite the traffic, it felt here that I was entering the proper countryside at last, and I was a little excited about visiting this church, if I am honest, as I had read so much about it. Coming back in 2009, the same excitement was tinged with an anticipation. This gorgeous little church is 13th century, all of a piece. As is common in this part of Suffolk, there are no aisles and no clerestory, and not even a clear division between nave and chancel. The result is a long, tunnel-like structure uder a thatched roof. The east end is illuminated within by Margaret Rope's last great work, Christ standing with two of his Disciples beside St John the Baptist. A simple crucifixion is set below it, and would have formed a backing to an east-facing altar. It is amongst the finest 20th century glass in Suffolk. If you look closely, you will see her signature at the bottom, a tortoise. The sweet roundels depicting scenes from the St John the Baptist story set in the windows on the north side are also hers. These jewel-like windows punctuate an important sequence of the wall paintings, which have been extensively uncovered and restored in the 1990s. The best is the Annunciation scene above a Y-tracery window.. Mary is engrossed in her prayerbook, as the angel descends quietly behind her. Other paintings show scenes of the Passion and the Seven Works of Mercy. St John the Baptist has a 15th century banner-stave locker, in which pre-Reformation liturgical regalia were stored. There are about a dozen of these surviving in Suffolk, mainly in this area. What makes Barnby's remarkable, however, is that it retains its original door, a unique survival in all England. It is set into the north wall of the nave. It is smaller than the others, and the door of ancient wood is pierced with tracery. And yet, one glance at it tells you that it was never finished. Photographs from the 1930s show the door hung the other way up, but it has now been restored correctly. The locker itself is still in use,but mundanely, for storing hymn books. The early 20th century rood beam and cross have been reset rather oddly at the west end of the nave, beyond the font on its brightly painted pedestal.To the north, there are photographs and memorabilia depicting this church in its Anglo-catholic heyday of the 1920s and 1930s. One picture shows the clergy and choir. On the occasion of my first visit, the old gentleman who let me in saw me looking at this photograph, and observed sadly that "there's less than that of us in the whole congregation now." 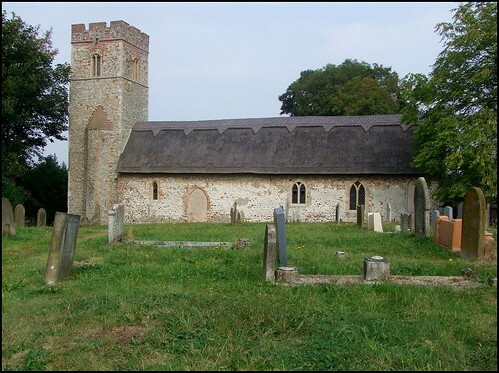 One reason that I love this part of Suffolk is how, away from the towns, this is a land of many churches and few people. Barnby was once a busy railway halt, but that has all gone now. There was an American airbase here during the Second World War, which now functions as a heliport, with some industrial use as well. But, generally, not many people live around here. Ten years ago, I had thought it hard to see how Barnby's church could survive and be sustained even within its joint parish with North Cove, other than perhaps as a rural outstation for weddings and funerals. However, I was delighted to discover on returning that, since my first visit, the numbers in the congregation here have actually gone up, and there are services at least once a fortnight. My expressed fear at the time, that this building must not be allowed to fall into the hands of the property developers at Diocesan House, is no longer an issue.